This Friday, 4.12.2015, we will have a Detant conflict management seminar, open for 10 veterans only. There will be other opportunities for Detant seminars later this year. During the week we will integrate shoulder and elbow arm locks against Daken distances. In most dojos we will also repeat the muto dori against a short stick techniques. At the 11th century, two identical twins were born in the central district of Beijing, Chen Chao and Chen Zaogao. Zaogao was an extremely strong child. He grew up to be invincible, a war lord in charge of many warriors at the vicinity of the Amur river. Zaogao loved to drink, eat meat and fight. He also loved the affluent life but he did not neglect cultivating his power. Zaogao was a renowned sword master, a superb archer and an experienced hunter. Zaogao surrounded himself with elite soldiers and commanders and a loyal unit of bodyguards. Those he suspected, he executed himself. He lived at the top fortified room, up the strong tower, inside the immense fortifications of his own, huge, castle, BaifangZi. Zaogao was big as a mountain, his face were red like the wine he loved so much, his eyes fierce and his temper short. One morning Zaogao woke from a bad dream, stood up to say something, got a cardiac arrest and dropped dead immediately. His brother, Chen Chao had a natural gift for painting and calligraphy when he was a small kid. When he was ten years old, after reading about it in an old manuscript, he succeeded in doing a Prana Bindu freeze for three days, at fifteen he could control his kundalini with a system of redirecting the force in the soshumna nadi, at twenty he got certified as a master in the Gelug-pa order and at twenty five he retired to a cave in the Pamir mountains and practiced Dzogchen meditation using astral projection under Atisha himself. Chao maintained a superb health by cultivating his Tapas in the snow, eating the local mountain honey and doing a daily practice of Yoga Chakra. At forty Chen was fair skinned as a child, with bright eyes and a wonderful smile that betrayed his strong sense of all encompassing love. One morning Chen woke up, went out of his cave to pee and got devoured by a patient snow leopard that has been waiting for this breakfast the whole night. The one that guarded the exterior, got killed by the interior. The one that cultivated the interior, got eaten by the exterior. This week we will not have an ECR session due to AKBAN seminar in Athens, Greece. During the week we will work in two separate areas. We will continue to practice the Ninjutsu counters to Muai Tai clinch and we will start exploring Muto Dori, in preparation for the 7th international colloquium in January. The Muto Dori kata in the Takamatzu Den Ryu are based in deep integration of Tai Sabaki and, of course, realistic execution of weapon attacks. Where we used to say ‘The body has a brain’ it now seems more accurate to say simply ‘The body is a brain’. Today, November the 18th, I checked out, as usual, all the knowledge assets I have been publishing over the last ten or more years. I answered comments, sent some mails and then peeked at AKBAN Youtube counter. Nice coincidence – 18,000,000 views and going strong. 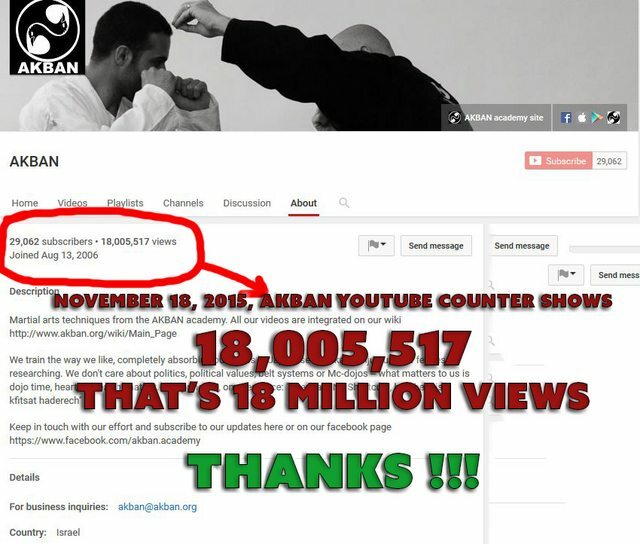 With a modest subscriber base of 29,000 in YouTube and about 21,000 monthly unique readers on the akban.org site. In a time of dramatic changes it makes me happy to see that my stable dedication to my students and to our martial art is rewarded with such positive vibrations. I send big Thank You to all my students in the dojo and in the world wide dojo. Practice safely, and keep on training! This Friday (20.11.2015) there will not be an ECR group. During the week we will focus on short stick levels of violence. In Jerusalem dojo we will work the short stick only on Wednesday. On Sunday we will work with full MT clinch. There’s a myth, among some of the HEMA practitioners, that, because the source is older it is somehow more authentic, or more authoritative, and that’s not necessarily true. What goes hand in hand with that is the idea that just because it was written down in the past, means that it’s unquestionable source, which again is not always true. There were bad fencers in the past just like there are bad fencers today. I wanted to let you know about a great learning opportunity that has just come out from my friend Miles Kessler and the Integral Dojo. He has just released a free mini-course on Aikido and the “Evolution Of Response”. This is a 3-part video series and it is full of great teaching content about about development in Aikido, and it also includes helpful reference guides to illuminate the Path of practice. Miles is an innovative Martial arts teacher with years of experience and also a certified Dharma teacher who already lead a meditation seminar in AKBAN. This free video mini-series will give you a wonderful way to apply Aikido and Budo principles to your life. The free video and reference guide will only be available for a few days only so be sure to check it out while you can. This Friday, 13.11.2015, at 08:00 sharp, we will have an ECR session in Tel Aviv dojo. We got an introduction to one of the critical but misunderstood aspects of Ninjutsu, the use of different levels of aggression for a variety of scenarios. Levels of violence is a field that is researched extensively in AKBAN Academy. Over the last week we practiced with advanced techniques against hand and sleeve holds. I am attaching videos of the main techniques we learned to this post. It is relatively easy to deal with these scenarios with high level of violence techniques, but a reliable and efficient reaction in low level of violence necessitates learning and practice. This week we will continue to solve close quarters grappling scenarios and will learn reaction both in high levels and also low levels of violence.